For the IRA volunteer, see Jackie McMullan. Jackie "Mac" MacMullan (born October 7, 1960) is an American freelance newspaper sportswriter and NBA columnist for the sports website ESPN.com. She attended Westwood High School in Massachusetts, and is a graduate of the University of New Hampshire, where she played Division I basketball for the Wildcats, MacMullan was a columnist and associate editor of the Boston Globe until she took a buyout from the paper in March 2008. She began writing for the Globe in 1982. From 1995 to 2000 she covered the NBA as a senior writer for Sports Illustrated. In 1999, MacMullan collaborated with Larry Bird on his autobiography Bird Watching: on Playing and Coaching the Game I Love. She released Geno: In Pursuit of Perfection with Geno Auriemma in 2006, and wrote the New York Times best seller "When the Game Was Ours" with Magic Johnson and Larry Bird in 2009. In 2011 MacMullan collaborated with NBA superstar Shaquille O'Neal to write his autobiography entitled Shaq Uncut: My Story. MacMullan has been a correspondent for several cable television networks including ESPN, CNNSI, and NESN, as well as WHDH-TV in Boston. She is a regular panelist on the ESPN program Around the Horn. She has also co-hosted episodes of the network's Pardon the Interruption. 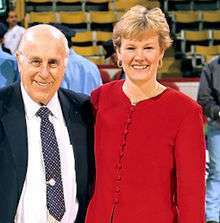 On May 12, 2010, Jackie MacMullan and longtime Cleveland Cavaliers radio play-by-play announcer Joe Tait received the Curt Gowdy Media Award from the Naismith Memorial Basketball Hall of Fame. The awards are presented annually to members of the print and electronic media who made a significant contribution to the game of basketball. MacMullan was the first woman to receive the honor in its 21-year history. On May 4, 2013, in an article for ESPN, MacMullan took a controversial stance among members of the Boston media when she suggested that the Boston Celtics should part ways with team captain Paul Pierce. ↑ "Jackie Mack Taking Latest Globe Buyout". bostonsportsmediawatch.com:Scott's Shots. Retrieved 2008-04-01. ↑ "Jackie MacMullan The Boston Globe Around The Horn Panelist". ESPN.com:ESPN Original Entertainment. Retrieved 2007-05-23. ↑ Finn, Chad (12 May 2010). "MacMullan is named Gowdy Award winner". Boston.com. Retrieved 14 May 2010. ↑ MacMullen, Jackie. "It's hard, but it's time to say goodbye". ESPN Boston. ESPN. Retrieved 4 May 2013.